I’ve mentioned around the web a few times that I pay for housekeeping, and I’m not ashamed by it one bit. I know this is a very unpopular topic in the personal finance space, especially when so many of us are pro-frugality. However, I think about it in a completely different way. Like most people who work and have families, I place an extremely high premium on my time. It’s very limited these days as I try to squeeze in work during every baby nap and late at night. Every weekend, I spend close to 15 hours working while my husband watches our twins. If I get a free moment, you can bet I’m going to prefer snuggling babies to scrubbing toilets so without the help, not much would get done. 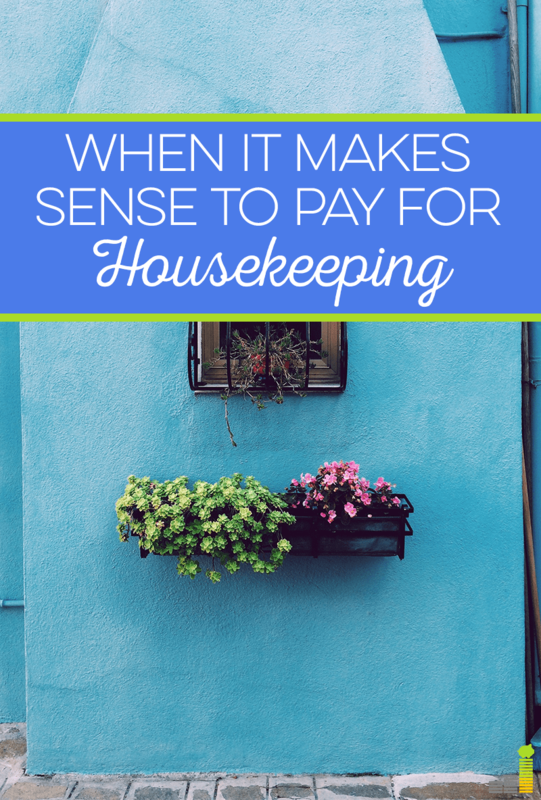 That’s not the only reason it makes sense for me to pay for housekeeping and why it might make sense for you too. I’m not trying to call anyone out but there are some people in my home who really value an environment that is squeaky clean. My husband and I both participate in cleaning during the day, but I’m a bit more lax when it comes to toys on the floor than he is. Now you might think that anyone can clean, but truthfully my housekeeper is a professional just like you and I are professionals at what we do. She cleans so fast and does things I wouldn’t even think to do, like wipe down the fronts of cabinets and dust pictures hanging on the walls. She really deep cleans the home so that it’s sanitary, which is important when you have little ones crawling around and eating anything they find on the floor. Sure, I could do this instead of her but not only would it take me more time, I’d rather be in charge of a 30 minute tidy up every day than a full on house scrub. My housekeeper comes twice a month and cleans for about four hours each time. That’s eight hours of my month that I got back. In fact, it’s probably more because like I said she is a professional and so lightning fast with cleaning. For me to do what she does would easily take me double the time. That’s now approximately 16 hours every month that I have saved. I value my time at about $100/hour, so that’s $1600 I could be earning. Now you tell me which is more valuable: my time which I could use to write, e-mail with advertisers, set up passive income, or do the priceless act of snuggling babies or the $140 I pay my exceptional housekeeper every month. I come out ahead every. single. time. and I get a clean house to boot. I admit, it’s weird at first to have someone in your home doing the chores you feel like you should be doing yourself. It’s even weirder to pay someone for this service when you’re a personal finance blogger. However, I simply put this expense under the general “help with kiddos” section of my budget, since she helps me keep the house clean for my kids’ safety and she allows me more time with them. Again, I know it’s not a popular opinion in the personal finance space, but I’m not the only blogger who has embraced this small luxury. The fact of the matter is, when you do the math and know you are very productive with your work time, it’s more than worth the expense. 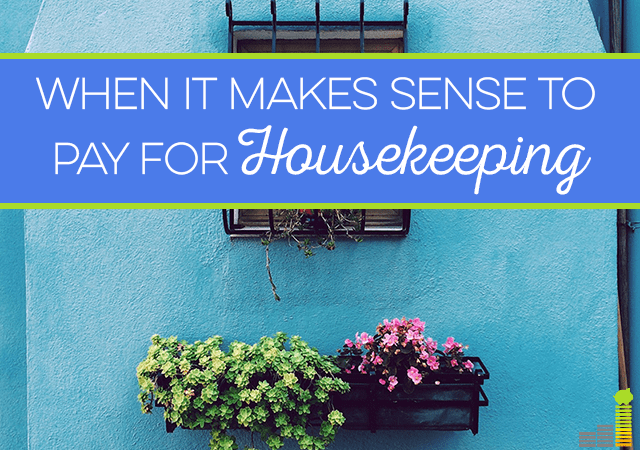 Have you ever considered hiring a housekeeper? What is your time worth? What are you willing to pay for housekeeping? No judgement here Cat! I totally get it. After having a little girl about 9 months ago I now appreciate more the luxury of time. Paying a bit more for convenience is now way more acceptable to me. I’ve never had someone clean my house but I have been tempted. Especially when I was at home on maternity leave…which is weird. Mike was working a lot and I didn’t have the energy or initial (post c sec) strength to do a lot.of the things I like done. With this in mind I might consider this if we have more kids. For now we manage pretty good. Yes I’ve heard a cleaning services is an excellent gift to give new mothers! I completely agree with your points. I was craving more time with my kids before I quit to stay home. Hubs and I have already had the conversation about hiring someone when they are off to school and I have to go back. Time is a truly limited resource. It is and it’s so important when you have a family! Hiring a housekeeper is a dream of mine. I’m in a one bedroom apartment, and I already can’t stand cleaning it. Haha I hear ya. Sometimes small spaces are harder to clean because there’s just not a lot of space to put things. I’ve always done my own housework even when I was working but have wanted to have a house cleaner come in, especially to do things like bath tubs and woodwork. I don’t mind doing vacuuming but has anyone besides me revealed the dirty (pun intended) secret that hardwood floors are horrible to keep clean? If anyone finds a really good way to sweep up the grit or grass that gets tracked in, please let me know. But I digress. My husband has always been opposed to having a cleaning service not because he wants us to do it ourselves, but because he doesn’t trust that something won’t get broken or stolen. It isn’t the cost involved, and personally, I like the idea of giving someone a job. I definitely understand the trust issue. My housekeeper found my watch under the couch on her second day working with us, and just came and handed it to me. I was in a different room. Since then, I’ve really trusted her. I have a housekeeper, it just happens to be my husband! He’s the clean freak in the family so I let him run with it! I was officially cut from the cleaning team last month. It’s been a huge weight off my shoulders to know that the cleaning is taken care of and I don’t have to worry about it. If we had kids, I could see justifying the expense. Haha now that my friend is an excellent arrangement. We couldn’t agree with you more. Two guys living in 1000 sq ft and we have some one come once a month. It takes us about 3 hours to do a thorough clean. For that amount of time we could make half of what we currently make and still be ahead. Being Money Conscious isn’t only about money, sometimes it’s about your time and the money could be making instead. Yes exactly! Time is money! Part of what makes being frugal so amazing is that it allows you to focus your resources on the things that matter most to you. I find that many frugal websites focus too much on the ‘saving’ side of things with very little discussion on the ‘spending’ or ‘enjoying’ side of things. For me, I am frugal so that I have more left over for the things that matter most to me and which give me enjoyment. It sounds like you do the same. I definitely love that perspective! I would do the same if I were you too. We pay for lawn upkeep and some people think we are crazy. We both hate doing it though and we’ve had bad luck with multiple lawn mowers breaking and the manufacturers not honoring their warranties. Hiring out is much nicer and it only cost a few hundred for the year, so why not? It makes sense for you because of your two little ones plus your freelancing work. I have a co-worker who pays for housekeeping and I’ll admit I did judge them. Mainly because they have no kids and they just were too lazy to do it themselves. And one difference if you’re not freelancing or have a side hustle, when you’re not at work, it’s not like your time is valued at your salaried rate because you may not be doing work outside of work hours. My cleaning lady, Marlene, has been with our family for almost 7 years and I am not ashamed to admit I have a cleaning lady. My biggest reason is the time that she saves my family. Back when I worked for a company, she earned me quality time with my hubby and son and now that I have my own company, she allows me to earn more money by working rather than cleaning. We have made numerous cuts in our lifestyle, but we agree we would never cut Marlene. I love this post! It’s so easy for us to judge others for financial decisions we wouldn’t make. I dream of the day that I can add a housekeeper to my budget. If you’re working at home, you want a clean house to work in. No judgment here – just envy. I think it makes sense if you can afford it. As someone who has cleaned houses before, they are happy for the extra work. I could not agree with you more. You have to put a value on your time and ask yourself what is the highest and best use of this time. I personally hate to do the deep cleaning and my wife would get overwhelmed if it all fell on her shoulders since we both work full time. Plus we have a large 3,300 sqft house, which could eat up hours of work. So we decided before we bought the house that we would hire a housekeeping lady. We pay about $120/month for the service of 3 to come in and do all the deep cleaning once a month for about 5-6 hours. Frugal or not, this is one of those things that just makes sense, especially when you realize that we all only have 24 hours in a day. I totally agree with the rationale. I currently have a housekeeper come in every 2 months for a deep clean. My wife and I maintain the in between time as best we can with a two yr. old. I also have law guys come from March- Sept. when our grass is growing like crazy. It looks great and I get to keep as much time as possible in the spring/summer to play with my daughter, visit family, stay outdoors and enjoy! You can never get that time back, so I enjoy “splurging” frugally on these things. I totally can see why you do this!! For right now, I do all the cleaning in our home. But I’ll admit – I DO have the time for it. Now that our girls are in daycare 10 hours a week, I devote that to working. During naps, I either work or clean. I hope to get up to 30 hours a week or more of work and if so, hiring someone to clean will be one of my top priorities!! I’ve owned a cleaning business for years and have had my own house cleaned for over 13 years. I’m a clean freak so I like the deep down clean my staff provide for me. But more importantly I don’t want to do it when I could be bringing in more money getting new contracts or working in my consulting/blogging business. If you’re broke, then no – clean it yourself but if you fall into the above a categories by all means hire a house cleaner. I’m not going to lie, I’m a bit jealous. I don’t think we will ever have a housekeeper. Mr. Maroon would be a nervous wreck about the security of the situation. But, we did a pretty good job cleaning everything over the weekend. I normally put it off because I think it will require too much effort. When in reality if I just get going, it’s not as bad as I anticipate. And MUCH better with some tunes and a glass of wine! I would love to justify this, but I just can’t in my own situation. Especially from working from home, my husband even made me sign a cleaning schedule between the two of us so we are doing our fair share. If you both work fulltime, it’s definitely worth it. I couldn’t agree more. I always hire one because I am a busy person. And, I’d rather work than to do the housekeeping. More importantly, she/he can do the job better than I can. So, hiring a housekeeper is really an advantage, in my case. This is an argument my husband and I have a lot. He is in favor of it, I’m too stingy. We both have health problems, so eventually I’ll probably cave. But for now, the mess just isn’t that bad. I’ve thought about this, but always decide against it. The main reason I decide against it is because I’d rather clean the house myself for now and save the money for home renovations. I think if I had a fully upgraded home with new floors, kitchen, bathroom, etc. I would definitely consider it. Almost all of my overseas friends have someone who comes in to help with the cleaning. Trust me when I say that those couples are super happy about the extra time that they have for one another. I pay for a cleaning lady too. Like you, my time is worth more than what she charges for an hourly rate and she is much faster and does a better job than I could ever do. It’s totally worth it to me! $140 for two cleanings/month?! That’s a really good deal. We pay $120 for one cleaning/month in Seattle and that’s a good deal for the area. I totally agree with the ROI. I am very allergic to dust, and have a messy toddler, so even though I don’t make near what I used to before having a kid, I’m happy to pay our cleaner. She cleans the inside of our toaster for God’s sake!